Product #16257 | SKU TR400 | 0.0 (no ratings yet) Thanks for your rating! PLEASE NOTE: The Titan Radio System is designed for commercial use. A UHF band radio license is required. Please contact us before purchasing for details on how to apply for your radio user license. Both the TR200 and TR400 are convenient and compact. No other radio on the market combines the features, battery life and power into such a small ultra-lightweight radio. The design of the radios were engineered to be simple and easy to use. No complicated display or useless buttons. 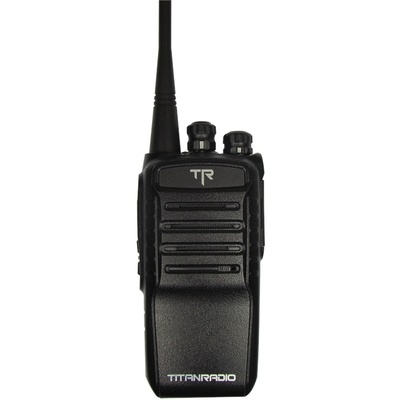 The Titan Radio portables are truly a “turn-key” radios. How durable and tough are the Titan Radios? Real-life testing wasn’t extensive enough for the Titan Radio engineers. They subjected both radios to extreme testing, which included dropping it off 30 foot platforms and running it over with motorized vehicles! They even had a demolition and drilling company demo the radio, making sure it could withstand the rigorous events of daily construction work. Because Titan Radio stands behind this testing, there is up to 3 years of warranty coverage on both products. Any of the 16 channels on the TR200 can be programmed UHF and you get the TR400 in either UHF or VHF. They also has a short press and long press programmable button(s) to enable features such as power adjust, monitor, priority scan, voice scrambler, VOX and battery indicator...to just name a few. Hook either up to a computer using the Titan Radio software and cable and you are on your way. Wide or narrow band is not a problem for either radio, making it compliant with the NZ/AU RSM mandate.